Madison County, New York, historian Matthew Urtz conveyed his satisfaction working with Buffalo State’s Garman Art Conservation Department in a recent article he wrote for the Oneida Daily Dispatch. 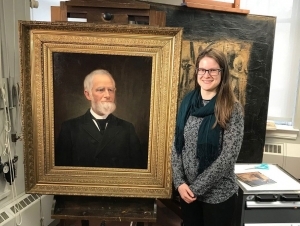 Urtz praised the work of the department in general, and specifically, second-year student Nicole Flam (pictured) who conserved a portrait of Benjamin Franklin Chapman, a judge from Clockville, New York, and later Oneida. This painting, along with three others Urtz brought to Buffalo State, once hung in the Madison County Courthouse. During a renovation of the courthouse in the 1960s, the paintings were put into storage and forgotten about until early in the twenty-first century. Because many were significantly damaged, Urtz sought conservation help and was pleased to find quality work at Buffalo State at a much lower price than private conservation businesses. So far, the department has restored three paintings and is working on the fourth—a portrait of Sylvester Beecher who served in several judicial roles in the early 1800s in Madison County, was elected as the representative to the New York State Legislature, and served as a captain during the War of 1812. Pictured: Buffalo State art conservation student Nicole Flam with the restored painting of Benjamin Franklin Chapman. Courtesy of Matthew Urtz.